Rockefeller Center Official Site - WebCam - Visiting Info. 11.15 - NBC announces "Christmas in Rockefeller Center" lineup. 11.16.11 - (Video) Rockefeller Christmas Tree Day 1 in 1 minute. 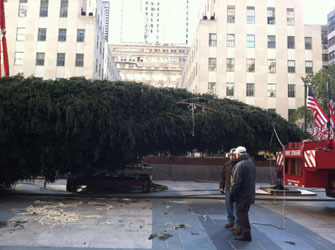 11.16.11 - (Video) NBC News - Crews cut down a 74-foot Norway Spruce from a backyard in Pennsylvania. 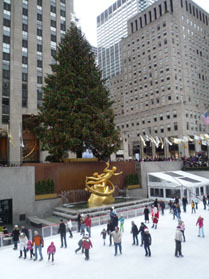 11.13.11 - Justin Bieber, Tony Bennett to play Rockefeller Center tree lighting. 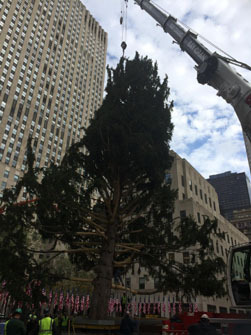 A 74-foot Norway spruce from Pennsylvania has been hoisted into place at Rockefeller Center in Manhattan for its starring role in a big Christmas tradition. Workers accomplished the task with a crane on Friday. The tree was cut down Wednesday in Mifflinville, Pa. It will be decorated with 30,000 multicolored LED lights. It will take five miles of wire to cover the tree, which has a girth of 46 feet at its lowest limbs. The lighting ceremony will be held Nov. 30. The lights will stay on until Jan. 7. After that, it will be milled into lumber for Habitat for Humanity. NEW YORK, Nov. 5 (UPI) -- Mariah Carey, Sheryl Crow and Josh Groban have signed up to perform at this year's Christmas-tree lighting ceremony in New York's Rockefeller Center, NBC said. Also slated to sing at the Nov. 30 event, which is to air on NBC, are Jessica Simpson, Susan Boyle, Annie Lennox, Katherine Jenkins, Charice, Kylie Minogue and Jackie Evancho. 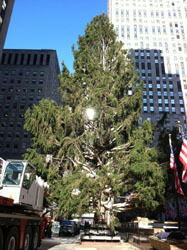 The 78th annual holiday show will feature a tree that is 74 feet high, 40 feet in diameter and weighs 12 tons, NBC said. The 2009 Rockefeller Center Christmas tree will be lit for the first time this holiday season on Wednesday, December 2, 2009, with performances from 7:00pm-9:00pm. The two-hour long program features various celebrity appearances and a star-studded musical lineup. The tree will be lit daily from 5:30 A.M.-11:30 P.M.; all day on Christmas (24 hours); and from 5:30 A.M.-9 P.M. on New Year's Eve. 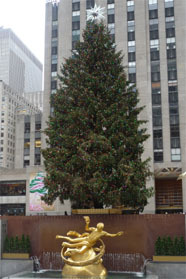 The world's most famous Tree will be on display until January 7th, 2010. NBC heralds the arrival of the holidays with a dazzling display of musical talent and the lighting of the world's most famous Christmas tree during the 11th annual "Christmas in Rockefeller Center" telecast. Hosted by Al Roker ("Today"), the star-studded 76th annual tree lighting extravaganza will feature superstars such as Jamie Foxx, Stephen Colbert, Miley Cyrus, Beyoncé, Tony Bennett, Neil Boyd, Jonas Brothers, Kermit the Frog and Miss Piggy, Harry Connick Jr., David Cook, Rosie O'Donnell and The Broadway Kids, Faith Hill, Rascal Flatts, and Solange Knowles performing current hits and holiday classics from Rockefeller Center in New York City. Prior to the network special, WNBC NBC's New York flagship station, will broadcast an additional live hour of the special (7-8 p.m. ET). NEW YORK -- If the chilly weather isn't enough of a clue, Friday brings another sign the holiday season is fast approaching. Rockefeller Center 's Christmas tree is in Manhattan and it's due to be set in its place later Friday morning, with the help of a crane. NBC weatherman Al Roker rode the tree into Rockefeller Center during the Today Show on Friday morning. The 84-foot-tall tree measures 48 feet around. It comes from Joe and Judy Rivnyak's yard in Shelton , Connecticut . The tree-lighting ceremony is planned for November 28. 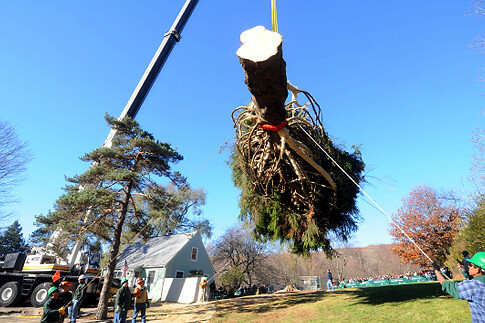 HARTFORD, Conn. -- An 88-foot Norway spruce from a western Connecticut home arrived in Manhattan Friday to become this year's Rockefeller Center Christmas tree. "It is hugely exciting and it's huge news in the neighborhood," said Rob Kinnaird, 58, an antique car restorer who remembers watching the tree grow outside his window as a child in Ridgefield, a community of about 22,000 people 70 miles southwest of Hartford. The Kinnairds even moved the driveway four times over the years to accommodate the growing branches. 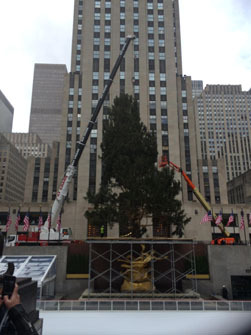 "I have pictures of my mom holding me out by the tree," said Kinnaird, adding that a stint at Rockefeller Center will be a perfect end for the tree. The 9-ton tree is 45 feet in diameter. 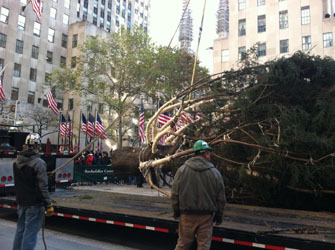 It was hauled on a flatbed truck to Manhattan, where workers will start putting it up at Rockefeller Plaza on Friday. Helicopters are used to scout for New York City's most famous Christmas decoration. Characteristics such as width, tree density and height, which must be at least 75 feet, are used to make the final selection. 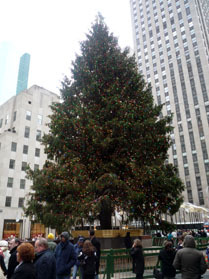 Connecticut has had its share of trees at Rockefeller Center. In 1999, a 100-foot Norway spruce, the largest in the center's history, was plucked from the yard of a Killingworth couple. 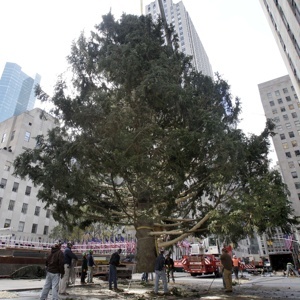 And in 2003, a 79-foot-Norway spruce in Manchester was cut down for the big holiday celebration. The tree will be decorated with at more than 30,000 lights and topped with a Swarovski crystal star. It will be lighted during a ceremony Nov. 29. The two-hour event will be broadcast nationally on NBC. The tree will remain in place until Jan. 8, continuing an annual tradition that started in 1933. Thursday morning and lifted into place. 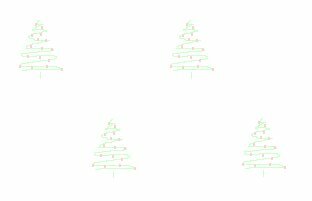 To Be Chopped Down In N.J.
A 74-foot-tall Norway spruce from Wayne, N.J., will be this year's Rockefeller Center Christmas tree, organizers announced early Wednesday. The tree, which weighs nine tons and has a 42-foot wing span, is scheduled for chopping at 10:30 a.m. Wednesday. It will then be loaded onto a 115-foot-long trailer and transported to Manhattan. 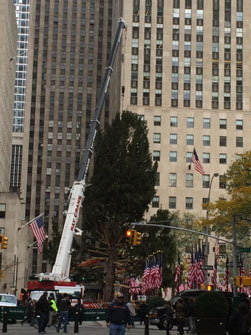 The tree, Rockefeller Center's 73rd, will be hoisted into place next to the ice skating rink at Rockefeller Center on Thursday morning. 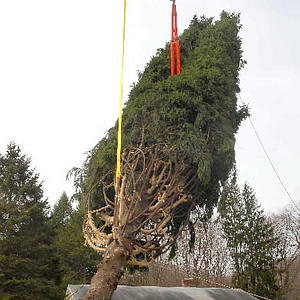 Last year's tree, a 71-foot-tall Norway spruce, was found on the property of a Suffern, N.Y., family.